Borrowing money isn’t bad. In fact, it’s a necessary part of life for many of us. Few people can afford to pay cash for a home, a post-secondary education or a vehicle. However mortgage payments and debt repayment can amount to a considerable portion of your monthly income. On top of that, you may be carrying some credit card debt. For some, it can be harder to make those monthly payments than expected. They soon start to feel like they’re “drowning in debt”. A sense of panic sets in. A job loss, tragic accident or serious illness could place them at risk of losing everything. No one wants that. While there are many smart ways you can get yourself out of debt - such as taking on a second job, selling off items you don’t need and cutting back on extra indulgences like eating out - the best thing to do is to stay out of the debt trap altogether. The debt trap is when you find yourself unable to make your payments each month. Sure you may have a bad month due to unexpected expenses such as car repairs, and be able to rebound in a month or two. But, if you consistently struggle to make your mortgage and car payments and you can barely afford to pay the minimum required amount on your credit card(s), you are caught in a cycle of debt. And it’s a very uncomfortable feeling. Let’s look at some ways to avoid falling into the debt trap. You likely know what your salary level is, but do you know exactly how much money you bring home each month, and where that money goes? Sometimes it can feel like it evaporates with very little to show for your hard-earned dollar. That’s why you should track all of your spending. Include everything from your morning coffee purchases to banking fees to your regular monthly payments. 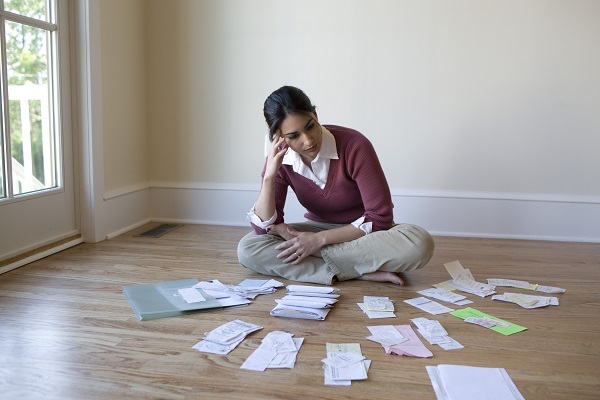 Keep your receipts for at least six months, and see exactly where your money is going. Compare what you’re spending with what you bring home each month, and you may be in for an eye-opening surprise. Add up all of your monthly payments including credit card payments (unless you pay them off in full each month), line of credit, car, mortgage and utility payments. Now compare that number to what you bring home. It should not exceed 40% of your income, before taxes. If that amount is more than 50% of your income, start looking at ways to bring it down. Sometimes it’s the unexpected expenses that can send you into a debt spiral, like necessary car repairs or an emergency trip to the dentist. So be ready for them. Determine an amount that you want to save each month, and treat it like one of your regular payments. Set up an automatic payment from your checking account to your savings. Then watch it grow. Do you remember the last time you bought something with bills and coins? Paying for purchases has become so fast and convenient. It’s as simple as tapping your card on the payment machine now! The trouble with the new way to pay is it doesn’t give you time to register what things are really costing or how much you’ve spent. If you use cash from your wallet, you have a better sense of how much of your limited funds you’re spending. Credit cards aren’t necessarily bad. In fact, having a credit card and using it wisely by paying it off in full every month can help build a solid credit rating. A good credit rating will bode well for you when you apply for a mortgage or a car loan. Almost 15% of your credit score is determined by your credit history. Choose a credit card that gives you something back such as money back on a percentage of your purchases, or Air Miles, which can be used for travel and even to pay for groceries at Safeway. The dark side of credit cards is that they make it very easy to fall into the debt trap. If you can’t pay off your cards in full each month, interest charges get tacked on. Over time you end up spending way more for that sweater than you would have if you were able to pay cash for it in the first place. Annual fees - Look at the annual fees very carefully. Some cards have annual fees as high as $400. If at all possible, choose a card with no annual fee. Late payment fees – Be sure to make your payment on time each month. If you’re even one day late, you may be subject to a painful late fee. Over-the-limit fees – Most credit cards have a very generous limit. But try to avoid going over that limit because there are high fees for doing that. Cash advance fees - Most companies charge from 2%-4% of the amount advanced, with no maximum amount. Don’t use your credit card to borrow money, ever. Balance transfer fees – If you decide to transfer the balance from one card to another to get a lower interest rate, be aware that this will cost you. Make sure you factor in the fee before switching. If your credit cards are creating problems for you, then throw them in a bowl of water in the freezer until they are completely paid off. Then see how long you can leave them there. You may be surprised to discover you don’t really need your credit cards after all. Even if you feel you can afford certain things, you can increase your financial security by going on a “financial diet”. Maybe you only watch a few channels on your cable package and you can live happily with just Netflix. Challenge yourself to use up food from your freezer before buying fresh from the grocery store. Give up your gym membership and replace it with lower-priced classes at a home studio or use a yoga app on your tablet. Limit meals out to once a month. Bring coffee to work in your portable mug and skip the drive-through. Chances are the Joneses are deeply in debt because they always have the latest and greatest. Do what makes sense for you and your budget. Purchase a house you can easily afford on your current salary. Pay off your vehicle and drive it for a couple more years while you continue to put those “car payments” in your savings account. Adopt a conservative stance on spending. Look into buying used furniture if you can’t pay for new outright. Live below your means, and you’ll always have money in the bank. Money, or lack of it, is a major contributor to stress in one’s life. When you know how much money you have and what you can afford to spend, you’ll be more careful about how you spend it. Imagine the peace-of-mind you’ll enjoy knowing that you’ve managed to stay out of the debt trap.